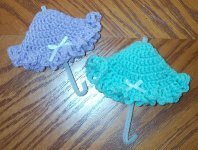 Here are a couple of items for a baby shower. I hope to have all kinds of party favor's for more different kinds of shower's. To place an order just send me an e-mail. Ohio residents has to pay a sales tax for the county that they live in. Will need notice if ordering any of these. I only have the one sample made and that is is. Looking for a baby shower favor? Here is a baby buggy. Very cute I think. Price for these is $3.50. Does not include postage. Here is another party favor you might like. It is a tiny baby bootie. It holds a 2 oz plastic cup and good for putting nuts, mints, or something small on the inside. Price for one of these is $1.25. Doesn't include postage. This is an umbrella. Would be a great item for a baby shower or even a bridal shower. Price for one is $2.50. Looking for something different for that baby shower. Here is a spoon baby that I have designed. It was also published by Annie's Attic. Price for one is $2.00. Postage not included.